How to choose the best table for your living room. The best dining table for you will be one that works for your budget, is solidly constructed, fits in your space and has a style you’ll love for years. There are some core factors you should consider when choosing a good one. Along with affordability and a timeless style, stability and construction are important to look for when inspecting tables at furniture stores. Think about how it feels to sit at one of those tables, whether it will be comfortable for long periods, and examine floor models for signs of wear. Look for nicks and scratches that may indicate how the tables would endure through serious use at home. The number one rule: Your dining table has to fit your dining area! But a dining table is a deceptively large piece of furniture, and you need to account for space around it, too. ■ Wood: Solid wood is a classic material because it is durable and easy to repair. Pine, acacia, mango and teak are popular, less expensive options. Man Wood expands and contracts with heat and humidity and can show scratches and wear, but is fairly easy to repair. ■ Veneer/Wood-Look: Wood veneer is often a more affordable alternative to solid wood. Here a very thin layer of solid wood (or material printed to look like wood) is glued to a plywood or other wood core. To identify good veneer, look for tables with clearly-labeled core interiors, like kiln-dried hardwood. One way to spot cheaper veneers is to look underneath the table at the store. ■ Stone and Stone-Look: Stone tabletops can include marble, quartz composite or cast stone (like cement). Stone is durable but can be porous and can absorb stains easily. ■ Glass: Glass tabletops can include clear, frosted or tinted versions. Though glass isn’t susceptible to moisture, it can chip, scratch or crack from heat. It also shows every fingerprint. 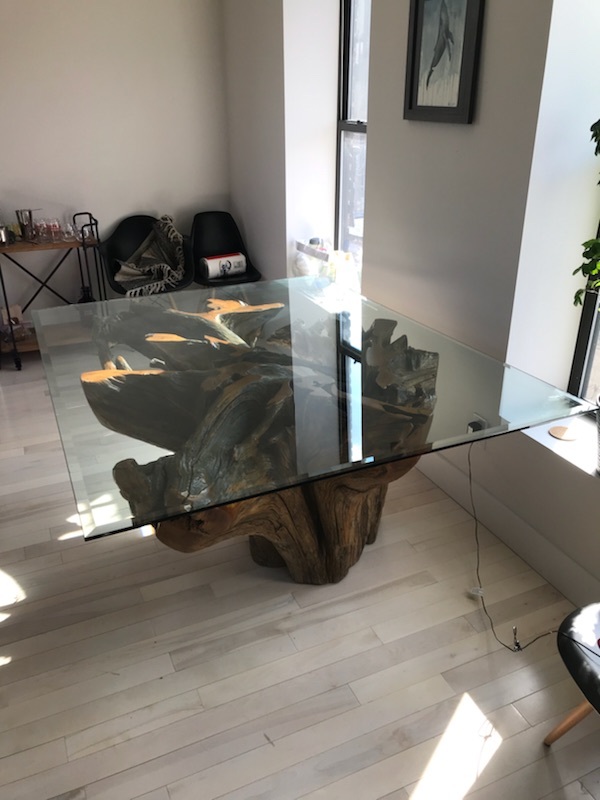 A good glass table top can last decades if you’re not too clumsy, but it will start to look bad quickly if you’re prone to chipping the edges or scratching the tabletop. ■ Metal: Metal, including stainless steel, brass, zinc and lacquered or painted versions of these, is used more frequently for table bases than tops.But because of its higher-shine, it shows every fingerprint and can require special cleaning tools. Also, painted metals can be hard to repair. These can be less expensive than wood tables, though it’s rare to find an all-metal dining table beyond utility tables.